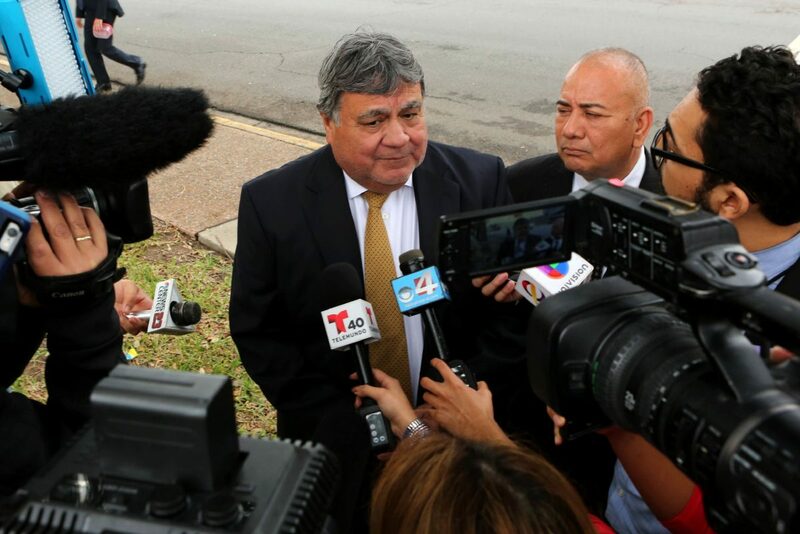 State District Judge Rodolfo "Rudy" Delgado, center, speaks briefly to members of the media with his attorney Adolfo "Al" Alvarez, right, after posting bond for charges of bribery Monday, Feb. 5, 2018, in McAllen. McALLEN — An ex-judge has filed a motion to have his trial proceedings moved to McAllen, court records show. Former state district judge Rodolfo “Rudy” Delgado wants the court to hold the trial in McAllen, but government prosecutors are opposed to such a change. This comes after a court granted a motion last week to delay his trial until 2019. Filed last Friday by Delgado’s attorney, Michael W. McCrum, the amended motion for a change of venue for trial only, cites several reasons why the court should move the trial from its current site of Houston to McAllen. Among some of the arguments McCrum makes for Delgado’s bribery trial to be moved to McAllen are public policy concerns, the location and availability of his client’s witnesses, and what McCrum says would be a lack of a support system for Delgado if the trial were to be held in Houston, the motion states. Delgado, who faces eight federal charges related to allegations that the former longtime judge accepted bribes from attorneys and others in exchange for judicial favors in his courtroom, was arrested in early February and indicted the following month. He argues the government’s reasons for wanting a trial in a certain division “must be balanced” against the “serious hardship of defending prosecutions in places away from ‘home,’ and that Houston jurors and the community at large would think “people in McAllen must be corrupt, or accepting of corruption,” if the trial were to be held in Houston. To further support his argument, McCrum attached a two-page list of 20 high-profile bribery, fraud and extortion cases that were all tried or held in the same location where the respective alleged acts occurred — six of which took place in the McAllen division. Of the 20 cases, three cases involved figures such as Donna school board members Eloy Infante and Elpidio Yanez Jr., and Hidalgo County sheriffs Brigido Marmolejo and Lupe Treviño — all either plead guilty or had their trials held in the McAllen division where their alleged acts took place, the filing states. The San Antonio-based attorney also makes the case that holding the trial in Houston would “impede” the media’s ability to cover the trial — depriving the local community of press coverage of the trial. Delgado’s attorney states another reason for his motion to change the trial’s venue, is that the majority of the people affiliated with the trial, those interviewed by federal agents and related to the case, live and work in the McAllen area. He also cites that Delgado lives in the McAllen-Edinburg area, as do most of the witnesses he is planning on calling to testify during trial. In a separate two-page attachment, Delgado states he is planning to call as many as 15 witnesses, at least eight of whom are Delgado’s siblings, saying they all “reside and work in the McAllen area,” the court record states. “It would cause an extreme hardship on such witnesses to leave their respective families and workplaces to travel to Houston..” the record states. The idea is Delgado would suffer “harm,” during trial if he could not have his witnesses readily available to take the stand in his defense because of the more than six-hour travel required from McAllen to Houston. “Conducting a trial in Houston will necessarily impact to a significant degree the availability of witnesses for the defendant. Contemplating a six-hour or more drive one way from McAllen to Houston, with the possibility that a certain witness, or witnesses will not go on the stand at the time or on the day anticipated, will cause great inconvenience to the witnesses from McAllen,” the motion states. But if the trial is held in McAllen, McCrum argues those witnesses could be placed “on call,” and would be ready, as they would only be “minutes away” from the courthouse. Delgado, if the motion is not granted, stands to be deprived of available witnesses, the availability of friends and family to provide support during trial, and a jury of peers who “understand the cultural, ethnic and locally unique nuances which the Constitution and courts have recognized as crucial to an accused,” if his trial is held in Houston. A decision from the court on whether or not to grant McCrum’s motion could come as early as this week.